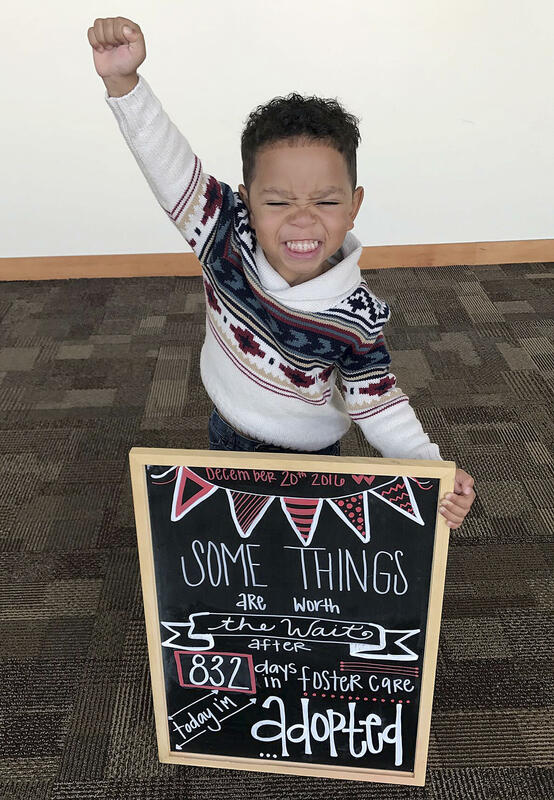 PHOENIX -- A 3-year-old Arizona’s boy celebration of his adoption is a huge hit. Dezhianna “Dae” Brown’s Twitter post of photos of her adoptive brother Michael had more than 55,000 retweets and nearly 140,000 likes by Friday afternoon -- three days after it was posted. In one shot taken at court, he raises his fist in the air. Another shows him posing with Brown and another adoptive sister. A sign Michael holds in one of the pictures indicates he spent 832 days in foster care. The little boy is now a member of a family living in Phoenix’s Peoria suburb. Brown says Michael was “super-shy” when placed with family as a foster child in early 2015 but has since opened up and bonded with her family. Brown told The Associated Press in an interview Thursday that her mother, Tara Montgomery, adopted Michael on Tuesday. Court spokesman Vincent Funari said he could not discuss a child dependency case.